Thursday 17 December 1903, in the USA, on the deserted beaches of North Carolina, at a place called Kitty Hawk. The dawn was grey and misty. The engine started and it ticked over perfectly. Orville Wright applied full power and released the tether. The Flyer slid along the rail slowly gaining speed. Five people from the village witnessed this historic event : the first sustained and controlled heavier-than-air powered flight. Paying tribute to this feat, FAI publishes below a text written by an enthusiastic Swiss private pilot, who offered to describe in his own words this historic flight, which marked the beginning of an extraordinary human and technological era for mankind. See also other links relative to the same subject at : www.fai.org/centenary/wright.asp. Thursday 17 December 1903, in the USA, on the deserted beaches of North Carolina, at a place called Kitty Hawk. The dawn was grey and misty; it had rained during the night. Looking into the distance the ocean seemed black, the wave crests forming white horses. There was a cold wind blowing, making the sand swirl a bit and the sparse thorny shrubs growing on the dunes sway gently. Orville, the younger of the two Wright Brothers, observed the wind, trying to estimate its strength and direction. Since sunrise, the north-north-easterly wind had been steady, but strong, at about 20 kt (>35 km/h). But now everything was ready, no detail had been neglected. The two brothers knew the place well and understood the pattern of winds over these beaches perfectly. They had already spent three long periods of time at Kitty Hawk in 1900, 1901 and 1902. They had made more than 1000 flights on their gliders, ground-hops from one dune to another, and they had acquired a solid mastery over their machines. This year they have high ambitions: if everything works according to plan, they intend to carry out the first-ever powered, controlled flight in history in a heavier-than-air machine. For the past several weeks they have been fettling their new invention, this motorised flying machine that they have baptised the “Flyer”. The design of the Flyer was entirely based on the experience and data that they had accumulated in the previous years flying their gliders. The way the aeroplane was constructed incorporated all these parameters. It is a wood and fabric biplane; 12.3 m long with a total wing area of 47.4 sq m. But there is just one problem : it’s a bit heavy. Including the engine, propellers and pilot, 350 kg! According to their calculations, the maximum weight which will still allow them to get airborne would be something like 310 kg. So the slight excess of engine power and the strong wind on this December morning are destined to prove very useful. They make the decision to fly and Orville wins the draw to make the day’s first attempt. In one of the little wooden huts that serve both as workshops and as makeshift accommodation for the Wright Brothers, the mechanic Charles Taylor, who was responsible for building their engine, checks the tension of the transmission chains. Through a cunning system of pinions, gears and chains, this little four-cylinder engine drives two propellers. For the Wright Brothers, this engine is simultaneously their pride and joy and their main source of concern. 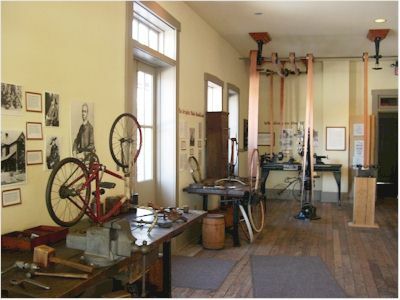 They devised and designed it and Charles Taylor built it in the workshop of the family business in Dayton, Ohio. 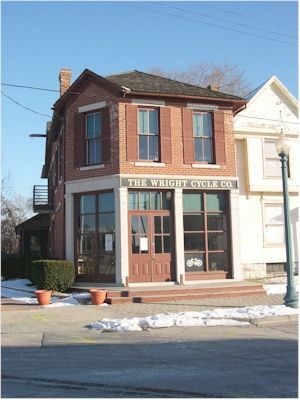 Orville and Wilbur Wright run a bicycle sale and repair business. So it is not at all surprising that some of the parts used to build the engine come straight out of their technical stock-room. From 1900 onwards the brothers paid visits to automobile exhibitions. In New York, they met French engineers who had built small cars fitted with an engine that developed about 20 horsepower. But these units proved to be much too heavy. The engine to be fitted to the Flyer could not exceed 80 kg! What is more, this car engine, with its large frontal radiator, was anything but aerodynamic. And so they resolve to take things into their own hands, and to design and build their own engine, exploiting every possible way of making it as light as possible. For this they use aluminium, a new material at that time, whose range of applications was only just beginning to be discovered. The water in the cooling system circulates in a series of tubes which rise as far as the level of the upper wing; the system is fully exposed to the airflow and only generates a small amount of additional drag. However, once installed and filled with oil and fuel even this engine still weighs 82 kg. It develops 16 HP during the early part of the flight, and then as it warms up, the power generated drops to13 HP. The power/weight ratio of the Wright Flyer therefore remains very precarious. In order take off, the aircraft needs to reach a speed of a least 40 km/h. As it is impossible to persuade it to taxi in the sand, the Wright Brothers have had a wooden rail laid down, just over 20 m in length. Taking into account the weight of the Flyer and the power of the engine, they also calculated the wind speed needed: 35 km/h. On the morning in question it was the son of the Kitty Hawk postman who had assembled the wooden rail for them, and oriented it exactly into wind. Then he returned to the village to invite some of the local inhabitants to come and witness the event. With this north-north-easterly wind of 40 km/h, Orville is certain that he will be able to take off; but the difficult part will be to keep the Flyer on its rail and then to stabilize it once it leaves the ground! Three days previously, Wilbur had achieved a perfect takeoff; he was 5 m up in the air and tried to initiate a turn to the left. The biplane banked more and more steeply and then stalled and fell back to earth after a flight of some 30 m. The sand absorbed the impact very well and there was no damage. The two brothers had been through dozens of incidents of this nature. Each time they analysed them carefully, reviewing the manoeuvres they had made, the attitude and the reaction of the aeroplane. Everything was very carefully written up. 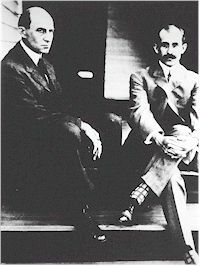 Orville and Wilbur Wright had quickly realised the historic importance of their experiments. They progressed step by step, always trying to understand the aerodynamic phenomena in theory before experimenting in practice. In Dayton, they even built a small wind tunnel, the first such aerodynamic test-bed, in which they tested several models. They did not put their lives at risk wantonly. They stationed the Flyer at the end of the rail and anchored it securely using a tethering rope. Orville stretched out in the prone position between the two wings and grasped the control levers. The engine started and it ticked over perfectly. Orville applied full power and released the tether. The Flyer slid along the rail slowly gaining speed. Five people from the village witnessed this historic event, and fortunately one of them was a photographer. The pilot gently eased back the controls and the aircraft left the ground. It flew! Less than 10 feet above the ground, but airborne nonetheless. Exactly as the two brothers had predicted. But, thrown out of balance by a slightly stronger than average gust, the Flyer returned to earth after only 12 seconds of flight, hitting a dune 36 m further on. Orville had been unable to keep control and one of the tail control surfaces had broken. The aircraft’s control system was very cleverly designed. A set of cables allows one wing tip to be raised whilst the other is lowered. Another control, the very one that broke during the first flight on 17 December, acted on the tail-plane, which was positioned behind the wings at the end of several struts. This system allowed them to control the stability of the aircraft in flight, to cause it to climb and descend, and above all to make turns. 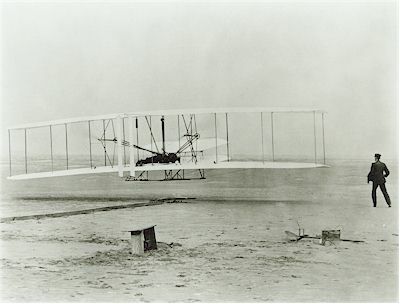 It is certainly this that represents the great contribution of the Wright Brothers to the conquest of the air. Not only did they succeed in making a heavier-than-air machine take off and fly, but they also invent the art of piloting. The cable to the tail control surface was quickly replaced and the Flyer put back on its rail. Time now for the second flight of this historic morning, this time with Wilbur at the controls. He made just over 50 m. A third flight by Orville was well controlled and achieved 60 m.
The fourth flight is the one that will go down in the annals of history. Wilbur stayed airborne for 59 seconds and covered 260 m. in a flight that remained perfectly stabilised and under control. That was the last flight of the day and they hardly have time to savour their triumph. A gust of wind overturns the Flyer and it is seriously damaged. Au terme de près d'un demi-siècle d'efforts, de progrès, mais aussi de polémiques et de déceptions, après une période d'exploitation commerciale d'un quart de siècle et l'accumulation de plus de 180 records du monde FAI, l'avion qui aura probablement le plus suscité d'admiration et de fascination prendra une retraite bien méritée à la fin de cette semaine. Retiré des lignes Air France le 31 mai dernier, Concorde effectuera ses derniers battements d'ailes le 24 octobre 2003 sous la bannière de British Airways. Coup de projecteur sur cet avion prestigieux, qui fera désormais partie de la légende et du patrimoine de l'aéronautique mondiale. 14 octobre 1947 : Charles Yeager (Médaille d'Or de l'Air FAI) franchit Mach 1 sur Bell X-1 en vol horizontal. Novembre 1953 : A. Scott Crossfield (Médaille d'Or de l'Air FAI) passe Mach 2 sur un Douglas "Skyrocket". 25 février 1959 : André Turcat, l'un des futurs pilotes d'essai de Concorde, bat le record du monde de vitesse sur circuit fermé de 100 km à 1643 km/h, sur Griffon 02 (Nord) – Record FAI no. 1347. 11 décembre 1967 : sortie du prototype Concorde 001 (F-WTSS) à Toulouse. 2 mars 1969 : Concorde effectue un premier vol de 42 minutes (Pilotes : André Turcat, Jacques Guignard). 1er octobre 1969 : lors de son 45ème vol, le prototype 001 passe pour la première fois Mach 1 à 11000 m.
4 novembre 1970 : André Turcat franchit Mach 2 sur le prototype 001. 13 octobre 1975 : obtention du certificat de navigabilité français. 5 décembre 1975 : obtention du certificat de navigabilité britannique. 26 décembre 1975 : le Tupolev Tu-144 est le premier avion commercial supersonique mis en service au monde. 21 janvier 1976 : Air France inaugure une ligne supersonique vers Rio, British Airways vers Bahrein. 24 avril 1976 : inauguration commune des lignes Londres / Paris – Washington. 17 octobre 1977 : après de nombreuses tergiversations politiques, l'interdiction d'atterrir à New York est enfin levée pour les 16 avions de série. 22 novembre 1977 : inauguration des lignes Londres/Paris – New York. Janvier 1979 : obtention de la certification américaine. 25 juillet 2000 : à 16h.44, le Concorde immatriculé F-BTSC (no. série 3) s'écrasa peu après son décollage de Paris-Charles de Gaulle. Le même soir, le ministre des transports Jean-Claude Gayssot ordonna l'arrêt immédiat des vols Concorde d'Air France, suivi au début du mois d'août par British Airways. L'enquête montra qu'un enchaînement fatal conduisit l'avion en pleine charge à la catastrophe, enchaînement initié par l'éclatement d'un pneu provoqué par une lamelle de métal tombée peu avant d'un autre avion. Des fragments de pneu percutèrent le dessous de l'aile, provoquant une importante fuite de carburant, des dégâts aux moteurs gauches et une importante perte de puissance qui ne permit jamais à l'avion d'atteindre sa vitesse minimale de montée. 28 août 2001 : après avoir renforcé les réservoirs et développé de nouveaux pneumatiques plus résistants, les certificats de navigabilité sont rétablis. 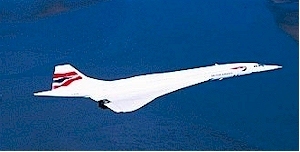 7 novembre 2001 : reprises des vols Concorde de British Airways et d'Air France. 31 mai 2003 : Air France arrête l'exploitation commerciale de ses Concorde. 24 octobre 2003 : British Airways arrête l'exploitation commerciale de ses Concorde. Pour replacer Concorde dans son juste contexte, celui de la durée, il faut rappeler que les accords qui ont porté Concorde sur les fonts baptismaux n'ont été signés qu'une douzaine d'années seulement après le décès, en 1948, de l'un des pionniers du vol motorisé, Orville Wright. En 1957, le trafic aérien transatlantique et le nombre de voyageurs des compagnies de navigation maritime arrivent à égalité : 1 million de passagers pour l'avion, autant pour les paquebots. Pour de nombreux observateurs de l'époque, il ne faisait aucun doute que le mode de transport le plus rapide allait dominer, parce que "la vitesse crée la demande". Dès le début des études, les ingénieurs de Sud-Aviation, qui jetèrent les bases de Super Caravelle, concept ensuite fondu dans le projet Concorde, imaginèrent un appareil moyen-courrier; ils n'hésitèrent du reste pas à envisager une Super Caravelle à propulsion nucléaire, et évoquèrent même brièvement une variante à décollage vertical ! Sa particularité opérationnelle était évidemment la consommation d'uranium infime, l'autonomie illimitée qui en découlait et la masse de l'avion inchangée au terme d'un vol, quelle qu'en soit la durée. La pile atomique et son blindage de protection auraient pesé près de 84 tonnes, pour une masse maximale au décollage de quelque 130 tonnes et une charge marchande de 15 tonnes. Les Français penchaient donc en faveur d'un avion moyen-courrier, tandis que les Britanniques estimaient que seul un long-courrier aurait un sens économique et opérationnel. Chacun fit une partie du chemin pour formuler le moins mauvais des compromis techniques et opérationnels, l'idée étant alors de concevoir des "avions jumeaux" : il s'agissait de deux versions complémentaires d'une même machine, différenciées par la distance franchissable, et cela moyennant un surcoût estimé à 15 % de l'investissement total. En octobre 1962, faute de s'être mis d'accord sur la distance franchissable, les deux bureaux d'études optèrent pour un compromis : l'avion volerait en croisière à M 2.2, ferait l'objet de deux versions complémentaires, un long-courrier de 90 places et un moyen courrier de 100 places, et leur masse maximale au décollage atteindrait respectivement 119 et 100 tonnes. Quelques mois plus tard, le modèle moyen-courrier fut discrètement abandonné et, au fil du temps, la masse maximale augmenta à 154, 166, 175 puis finalement 185 tonnes pour la version de série. Le nombre de sièges passa à 108, 118 (prototypes), puis 132 ou 138 sièges (série). Le processus de développement de Concorde fut finalement réparti entre la France (partie centrale du fuselage et voilure, commandes de vol, hydraulique, navigation, radio) et la Grande-Bretagne (nez, pointe arrière, dérive et nacelles, systèmes électriques, commandes et instrumentations des moteurs, alimentation en carburant et dégivrage). Deux certificats de navigabilité furent nécessaires, car le dédoublement de toutes les composantes du programme industriel conduisit à la création, sur papier, de deux Concorde : la version 101 française et la 102 britannique. De ce fait, chacune obtint son propre certificat de navigabilité, détail quasi-anecdotique qui joua pourtant un rôle important 25 ans plus tard, lors de l'accident de Gonesse. Tout au long du développement de Concorde, Européens et Américains furent victimes d'une même négligence : emportés par des considérations techniques, ils négligèrent l'analyse économique. Chez les premiers, les études de marché furent quasi inexistantes et, chez les seconds, elles furent tout simplement erronées. Le véritable coup d'envoi commercial vint des Etats-Unis lorsque Pan American choisit de conforter son image de compagnie novatrice. Le 3 juin 1963, son conseil d'administration approuva la prise d'options sur 6 Concorde. En 1968, Pan Am confirma son intérêt pour Concorde et signa pour 2 options supplémentaires. Ensuite, Continental Airlines, American Airlines, TWA et Middle East Airlines s'engagèrent à leur tour. Au vu des quelque 74 options reçues, les industriels commencèrent à espérer franchir le cap des 250 commandes fermes à l'horizon 1980. Ce n'est qu'en 1972, après que la Chine eut placé 3 commandes fermes et versé un acompte non remboursable, qu'Air France et BOAC, les compagnies nationales des pays d'origine de Concorde, placèrent leurs premières commandes fermes. Estimé en 1963 à 10 millions de dollars, le prix de Concorde prit rapidement l'ascenseur pour atteindre 46 millions de dollars vers la fin des années 60 (contre env. 28.3 millions pour un Boeing 747) et 70 millions en 1976, soit près de 225 millions d'euros aux conditions économiques actuelles, une somme proche du prix prévu pour le futur Airbus A380 de plus de 500 places. Alors que le prix s'envolait et que les performances de l'avion étaient jugées marginales en matière de distance franchissable et de rentabilité, confrontée à des difficultés financières, PanAm décida en janvier 1973 de renoncer à ses options; elle fut rapidement suivie par TWA, American Airlines, El Al et Sabena. En octobre 1973, le premier "choc pétrolier" fit flamber les prix du pétrole et annihila tout espoir de rentabilité commerciale de Concorde, handicapé qu'il était par une particularité extravagante : sa charge utile de 11 tonnes correspondait grosso modo à 5 % de sa masse maximale au décollage, contre quelque 15 % pour des avions long-courrier conventionnels. Finalement, au terme de nombreuses tractations, Paris et Londres se mirent d'accord en 1976 sur un compromis minimal : le programme continua, mais la série fut arrêtée au 16ème exemplaire. Air France accepta de prendre deux avions supplémentaires, à un prix unitaire récemment avoué de moins de 50'000 euros la pièce (en valeur de 2002) ! Le programme de développement, de certification et de production des 16 avions de série aura finalement coûté, en valeur de 2002, de 14 à 16 milliards d'euros, répartis entre les deux partenaires français et britannique. Fort heureusement, ces dépenses ne furent pas faites en pure perte, dans la mesure où elles incitèrent largement l'industrie à se surpasser et à imaginer de nouvelles solutions dont les retombées se font encore sentir en ce début de 21ème siècle. A titre d'exemple, rappelons que le bureau d'études de Nord imagina déjà des commandes de vol électriques, ainsi que l'ancêtre du mini-manche latéral que l'on retrouva 25 ans plus tard cher Airbus. C'est également le programme franco-britannique qui, le premier, fit largement appel à des ordinateurs très puissants, au calcul numérique tridimensionnel des écoulements aérodynamiques ou encore à des bancs d'essais. De même, c'est grâce à Concorde que la machine-outil à commande numérique, aujourd'hui banalisée, fit sa première apparition en France, ou encore que les méthodes d'enregistrement et de dépouillement des paramètres d'essais en vol firent un bond en avant décisif. De part et d'autre de la Manche et de l'Atlantique, Concorde dû faire face à de nombreux adversaires et comités qui s'opposèrent non seulement aux nuisances sonores de ses moteurs lors du décollage, mais également à l'onde de choc provoquée par le vol supersonique. Il est peut-être utile de rappeler que, lorsqu'un avion atteint la vitesse du son (aussi appelée Mach 1, en l'honneur du physicien autrichien Ernst Mach), il se produit un phénomène intéressant : on n'entend plus l'avion s'approcher, car ce dernier va plus vite que les ondes sonores. Au lieu de se diffuser au devant de l'avion, les ondes sonores forment un cône (onde de choc) que l'avion en vol supersonique traîne toujours derrière lui. À son passage, un changement soudain de la pression de l'air est ressenti, et le boum sonore caractéristique retentit. Le boum sonore n'apparaît donc pas uniquement au moment où l'avion traverse le mur du son, mais bien en tout moment lorsque sa vitesse dépasse celle du son et que l'onde de choc passe au-dessus de nos têtes. Il n'est donc pas étonnant qu'au début des années 1970, un sénateur américain parvienne à faire passer une loi interdisant le survol des terres à vitesse supersonique. Quel avenir pour le vol supersonique ? Dans les années 70, Boeing planifiait également un avion supersonique, le Boeing 2707, pour lequel Air France plaça d'ailleurs 6 options. En mars 1971, en renonçant à une courte majorité au financement du projet, le Sénat et le Congrès américains condamnèrent le programme sans appel. Le seul concurrent qui restait alors au Concorde était le Tupolev Tu-144, qui fut construit à 17 exemplaires et dont quelques-uns furent exploités de 1975 à 1978 sur une ligne postale entre Moscou et Alma Ata. Ironie du sort, c'est un Tu-144LL que la NASA loua en 1976 pour procéder à une série d'essais en vol conduits dans le cadre de nouvelles recherches sur le transport aérien supersonique. A ce jour, et malgré les nombreux projets évoqués au cours des vingt dernières années (nouvelles versions de Concorde, avions d'affaire supersoniques, avions hypersoniques), aucun avion n'est prêt à prendre la relève de Concorde. Pourtant, de nombreux progrès ont été enregistrés qui, appliqués à un supersonique de nouvelle génération, permettraient sans doute de répondre à certains problèmes rencontrés par Concorde tels que la consommation de carburant ou les nuisances sonores : meilleure aérodynamique, moteurs à cycle variable, matériaux composites pour la partie chaude de la structure, systèmes automatiques permettant l'optimisation de la gestion du vol, etc. Il est désormais peu probable qu'une nouvelle génération de transport supersonique n'apparaisse avant 2020. Lors de son retrait, Concorde apparaîtra donc comme un extraordinaire précurseur, précipité trop tôt dans un environnement qui n'était pas prêt à le recevoir. Et cela qui plus est, au moment même où l'aviation commerciale quittait l'ère des pionniers pour entrer dans celle des économistes et financiers. Tout au long de sa carrière, Concorde enregistra de nombreux records du monde homologués par la Fédération Aéronautique Internationale (FAI). Quelque 180 records du monde sont en effet répertoriés dans les archives de la FAI, le premier datant de 1976, et le dernier du … 8 octobre 2003; la FAI vient en effet de recevoir l'avis d'une tentative de record effectuée seulement deux semaines avant la mise hors service de Concorde (voir Communiqué FAI no 23/03). - 130 records de vitesse sur parcours reconnus. In 2005, on the occasion of its 100th anniversary, the Fédération Aéronautique Internationale intends to publish a work retracing its first century of existence and the parallel history of air sports. The writing of this book has been entrusted to Pierre Morath, an historian specialising in sport and the Olympic movement. Although the archives of the FAI will provide the bulk of the material needed for this future publication, the FAI is now launching an appeal to its members and associated organisations, and to custodians of historical archives, asking that they also contribute material to this project, which is destined to become an authoritative work of reference. A former elite athlete, Mr. Pierre Morath is an historian with a well-established reputation in the world of sport; amongst other publications, he was the co-author of the book published by the International Cycling Union (UCI) on the occasion of its hundredth anniversary, and of a work covering the history of the International Olympic Committee in Lausanne. For the research on the history of the FAI and air sports, Mr. Morath will be assisted by Mr Eilif Ness, President of the FAI from 1994 to 2000, whose wide knowledge of these subjects will add great value to the work. So as to ensure that the appeal of the book is not restricted solely to dedicated aviation enthusiasts, the FAI has decided to set its sights on publishing a book that can serve as an authoritative work of reference in the future. With this in mind, the book will include, apart from a section devoted to the development of FAI and its air sports, more specialised topics such as the technological progress made thanks to sporting aviation, the development of human performance, and the future of aeronautical sports. To be published in English and French, this book will contain about 220 pages and the text will be abundantly supported by historical photographs and illustrations. Although the FAI itself has impressive archives, it would like to give the opportunity to its members, and associated organisations, as well as to custodians of historical archives, to contribute material to this project, which is destined to be a significant landmark in the first century of FAI’s existence. The FAI is representative of the rich diversity of its member nations, and wishes to ensure that this aspect is properly reflected in the book it plans to publish. The history of sporting aviation resides above all amongst FAI’s member organisations, and is just waiting to be collected and presented to the public at large. Therefore, the FAI hereby invites any person or organisation to provide information about the existence of rare documents, photographic archives, documentary films, or any other reference material that might be relevant for inclusion in a publication of international scope (records, competitions, sporting or historical events, personnalities, etc.). All material received will be carefully analysed to see if it might be suitable for inclusion in the book. Unfortunately, there will not be space for everything received to be mentioned. However, one of the tasks of the FAI is to preserve the world’s sport aviation heritage, so any material that is sent to FAI, whether in the form of copies or originals, will be carefully conserved in our archives for consultation and as an important part of the collective memory that FAI will transmit to future generations. In the hope that this appeal will be widely supported, the Fédération Aéronautique Internationale thanks in advance all those who wish to make a contribution to the creation of a high quality 100th Anniversary book. All material sent will be acknowledged. As we are appealing to the sense of shared values and generosity of the aviation community, we much regret that the FAI is not in a position to purchase or reimburse costs incurred in dispatching material. Recipient of FAI’s top award, the Gold Air Medal, Mrs Ann Welch (United Kingdom) has died at the age of 85. She was a pilot with a lifelong enthusiasm and love for flying. The FAI remembers Ann Welch for her enormous contributions to the development, under the umbrella of the FAI, of no less than four sports - Gliding, Hang Gliding, Paragliding and Microlight Flying. The words Ann Welch used to open her 1983 autobiography (“Happy to Fly”) are a perfect illustration of the dream and motivation that accompanied her long life as a pilot. Already as a child, Ann Welch kept a diary listing every aeroplane that flew over the house. Later, after she had acquired a motorbike to visit the local aerodrome, her dream came true, and in 1934 she obtained her pilot’s license at the age of seventeen. She started gliding in 1937, but soon the 2nd World War broke out. Enrolled in the Air Transport Auxiliary, Ann Welch greatly expanded her flying experience by ferrying all kinds of new aeroplanes - Spitfires, Hurricanes, Blenheims and Wellingtons - from the factories to operational units. After that difficult period, she concentrated on gliding and on the training of pilots and instructors. Ann Welch contributed greatly to the early development of gliding in Great Britain. For 20 years, she was in charge of the British Gliding Association Examining Panel. As Manager of the British Gliding Team, she accompanied the team to many international competitions and organized World Gliding Championships in Great Britain in 1965. Later, she was elected as delegate to the FAI International Gliding Commission and acted as jury member at several World Gliding Championships. Always alert to new opportunities for young people and those on tight budgets to take to the air, she closely followed the development of the new flying technologies, and was founder President of both the FAI Hang Gliding and Paragliding Commission (CIVL, 1976) and the FAI Microlight Commission (CIMA, 1982). On leaving elected office, she was appointed President of Honour of both these Commissions. Her publications – training manuals, guides to contest organisation, sporting codes, as well as narrative accounts of her experiences – are widely admired. “I liked the FAI because it was a great and civilised gathering of enthusiasts, people from all over the world working together for the sort of flying we loved”. As she wrote in her autobiography, Ann Welch was highly motivated for FAI : for many years, she was also UK's delegate to the FAI Gliding Commission, member of the FAI Council for UK and editor of the FAI Bulletin. Ann Welch was awarded the FAI Bronze Medal (1969), the Lilienthal Medal (1973) and the FAI Gold Air Medal (1980) in recognition of her devotion to the training and encouragement of young pilots (see FAI Awards). FAI deeply regrets the lost of a real enthusiast for Air Sports and hopes that Ann Welch will remain an inspiration to present and future generations of those who love to fly. The Fédération Aéronautique Internationale (FAI) - the World Air Sports Federation - is the sole organisation authorized to certify aeronautical and astronautical world records worlwide. 75 years after the first non-stop solo Transatlantic flight, the FAI opens its archives to celebrate the event that changed the course of aviation history. As Raymond Orteig, a New York hotel owner, offered a $25,000 prize to the first aviator to fly an aircraft directly across the Atlantic Ocean between New York and Paris, Charles Lindbergh started to build a special plane. On May 20th, 1927 the heavy loaded Spirit of St Louis took off with 451 gallons of gas, two canteens of water and … 4 sandwiches ! After clearing the obstacles at the end of the runway, Charles Lindbergh continued his flight over Cape Cod and Nova Scotia. As darkness fell and low fog started to form over the sea, Lindbergh headed for the open Atlantic. After several hours fighting against nature, avoiding storm clouds and trying to find a way around the fog, the first indication of his approach to the European coast was a fishing boat. After flying over Ireland and England, he saw the French city of Cherbourg passing below his wings as the sun went down for the second time during the flight. He circled the Eiffel Tower, flew over the airfield and finally landed at Le Bourget at 10.22 PM. Charles Lindbergh had conquered the Atlantic alone, covering 3610 miles in 33 ½ hours and won the Orteig prize. The certification of this flight required several documents to prove the performance. A sealed barograph, an instrument working with atmospheric pressure, was loaded on the aircraft; its six-hour cylinder recorded the altitudes flown and proved that the flight was uninterrupted. The start of the flight was attested by the US National Aeronautic Association and the Procès-verbal established by the Aéro-Club de France on Lindbergh’s arrival attested that the barograph was found sealed and reported that 322 litres of gas (85 gallons) remained in the sealed tanks. This Procès-verbal was signed by no less than 13 French officials, the US Ambassador Myron Herrick, the Belgian Air Attaché Willy Coppens and, of course Charles Lindbergh himself. Finally, the FAI General Secretary Paul Tissandier informed the National Aeronautic Association on August 31st, 1927, that Lindbergh’s flight was certified as the « Class-C World Record for non-stop flight over a distance of 5809 kilometres ».